In eukaryotic plants, photosynthesis is carried out by the organelles known as chloroplasts, the best known members of the great class of related and interconvertible organelles known as plastids. Detailed accounts of these organelles may be found in Kirk and Tilney-Bassett (1978), Staehelin (1986) and Falkowski and Raven (2007): we shall here content ourselves with a rather brief treatment. The chloroplasts contain the pigments that capture the light, the electron carriers that use the absorbed energy to generate reducing power in the form of NADPH2 and biochemical energy in the form of ATP, and the enzymes that use the NADPH2 and the ATP to convert CO2 and water to carbohydrate. The pigments and electron carriers are contained in a specialized type of membrane known as the thylakoid. The enzymes of CO2 fixation are distributed throughout the rest of the inner volume - the stroma - of the chloroplast, although in certain algal chloroplasts some of the enzymes may be located in a specific structure within the chloroplast known as the pyrenoid (see below). In cyanobacteria, the most plentiful photosynthetic enzyme - ribulose-1,5-bisphosphate carboxylase/oxygenase, also known as carboxydismu-tase, or Rubisco - is located in an icosahedral crystalline structure known as a carboxysome. Chloroplasts occupy a substantial proportion of the cytoplasmic volume outside the vacuole. There is usually enough chloroplast material per cell to ensure that most of the light incident on the cell passes through one or more chloroplasts. 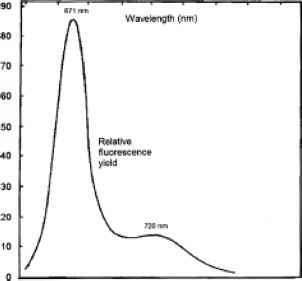 As we shall see in a later chapter, however, the disposition of the chloroplast(s) within the cell, and hence the proportion of the cellular cross-section occupied by chloroplast substance, can vary with light intensity. In higher plants, including aquatic species, chloroplasts are typically lens-shaped bodies, 4 to 8 mm in diameter and about 2 mm thick in the centre. There are commonly 20 to 400 chloroplasts per mature leaf cell, depending partly on the size of the cell. In terrestrial plants, the chloro-plasts occur mainly in the palisade and mesophyll cells of the leaves, whereas the plastids in the epidermal cells usually do not develop into chloroplasts. In submerged aquatic plants, however (the only kind with which we are concerned in this book), the epidermal cells often have well-developed chloroplasts. The palisade layer within the leaf in some cases does not develop at all, being replaced by spongy parenchyma.603 Stomata are scarce or absent in submerged leaves, the CO2 presumably being taken up directly through the epidermal cell walls. Among the eukaryotic algae, chloroplasts vary greatly in size, number and morphology. Comprehensive accounts may be found in Fritsch (1948), Bold and Wynne (1978), Raymont (1980) and Larkum, Douglas and Raven (2003). In both unicellular and multicellular algae, chloroplasts can occur singly, in pairs or in numbers of up to 100 or more per cell. In many algal species the chloroplasts contain dense bodies, 1 to 5 mm in diameter - the pyrenoids. These are often the site of polysac-charide deposition and are tightly packed with granular or crystalline aggregates of what appears to be ribulose bisphosphate carboxylase. Fig. 8.1 Some algal chloroplasts. c = chloroplast, p = pyrenoid. (b)-(e) after West, G. S. (1904), The British Freshwater Algae, Cambridge University Press. they are usually lens-shaped and of similar size (a few mm in diameter) to higher plant chloroplasts. If we direct our attention to individual groups of algae, some useful generalizations are possible. Most of the green algae (Chlorophyta), major components of both the attached and the planktonic flora, contain one chloroplast per cell. This may be a cup-shaped structure as in Chlamydomonas, Chlorella and other unicellular planktonic species, or it may have a spiral, flat or other shape in the large-celled filamentous forms. Some desmids contain two chloroplasts per cell. Three of the 15 or so orders of green algae, the Caulerpales, Siphonocladales and Dasycladales, have a coenocytic construction. As well as having some cells of normal construction they have tubular filaments lacking cross-walls. These tubular structures contain large numbers of, usually lens-shaped, chloroplasts. The brown algae (Phaeophyta) may contain one, a few or many chloroplasts per cell. The Laminariales and Fucales, two orders of particular importance for coastal primary production, both contain numerous chloroplasts per cell in their large thalli. A characteristic of these brown algal chloroplasts is that when they contain a pyrenoid, this forms a bulbous structure protruding out from the otherwise lens-shaped chloroplast. In that very diverse division the Chrysophyta (yellow, yellow-green or yellow-brown single cells), also known as Heterokontophyta, we shall consider, on the grounds of their major contribution to planktonic primary production, just one of the classes - the Bacillariophyceae or diatoms. Diatom species often form the major component of the phyto-plankton in both fresh waters and in the cooler higher latitude regions of the ocean. In the centric (circular) diatoms the chloroplasts are commonly small, lens-shaped and numerous. In the pennate (elongated) diatoms, fewer (often only two) and larger (lobed or plate-like) chloroplasts are present. The class Prymnesiophyceae, in the division Haptophyta, includes the coccolithophorids, major constituents of the marine phytoplankton, particularly in the warmer regions. Members of this class typically have two, but sometimes four or more, lens-shaped chloroplasts. The division Dinophyta (formerly Pyrrophyta), or dinoflagellates, is a major contributor to aquatic, especially marine, primary production; being comparable in importance to the diatoms. The Pyrrophyta are made up of two classes, the Dinophyceae with numerous small, lens-shaped chloro-plasts and the Desmophyceae with few, plate-like chloroplasts. Members of the Euglenophyta, unicellular flagellates of common occurrence in ponds, have a variety of types of chloroplast structure, ranging from large numbers of lens-shaped plastids (Fig. 8.1) to small numbers of large plate-like or ribbon-like bodies. Another group of unicellular flagellates, the Cryptophyta, occasionally significant components of the phytoplankton in coastal waters, contain usually two, but sometimes one, chloroplast(s) per cell. The Rhodophyta, or red algae, are predominantly thalloid in form and occur mainly in marine habitats. They are major components of the benthic (growing, attached, on the bottom) flora of coastal waters. They can be divided into two groups: the Bangiophycidae, which usually have a single, stellate, axial chloroplast; and the Florideophycidae, which normally contain numerous small lens-shaped chloroplasts around the periphery of the cell.